Built in Aromatic Red Cedar, milled for a smooth finish. Also available with outdoor sealer for an additional cost. Umbrella not included. Come together to this Poly Vinyl 4' Round Table Set. This set includes four regular chairs and one table. Call to see what colors are available. Best of all, poly vinyl is 100% stain-proof! - Standard with umbrella hole. Table: 1 box delivered by common carrier; some assembly required. 28" Table Bench (4) - 1 box; comes fully assembled. Gather 'round with the Poly Vinyl 4x6' Oval Table Set. The set includes four regular chairs and two captains chairs, set up to make your outdoor meals feel as comfortable as your indoor ones. Every piece is 100% stain proof and built to last! Amish craftsmen put as much care into poly vinyl furniture as they do into wood. This set pairs Amish workmanship with a very durable material that will look beautiful on your patio for years. Table - 1 box delivered by common carrier; some assembly required. Treat yourself to fun outdoor gatherings without the worry of stains. For those who have had their eye on both the poly vinyl bar table and the chairs, here is a full set. This set is a testament to how well these pieces match together. As always they are made with beauty and durability in mind. *The plastic table and chairs are available in White, Black, Chestnut Brown, Weatherwood, Green, Dove Gray/Slate, Dove Gray/Black, Cedar/Black, Weatherwood/Chestnut Brown, Weatherwood/Black, Cherrywood/Black, Antique Mahogany and Antique Mahogany/Black. Regular ChairÂ (4) - 1 box; comes fully assembled. This quality square outdoor dining set is made of Poly Vinylethylene. The high density Poly Vinylethylene raw material utilized in Poly Vinyl lumber is derived from post-consumer bottle waste such as milk containers. The material is cleaned in a decontamination process to a purity level of over 99% HDPE. It is then compounded into rigid board stock material; the resulting plastic table and chairs contain over 90% recycled post consumer waste by weight. 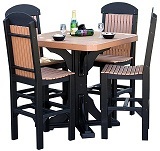 Use the drop down boxes shown top right to select options for your square outdoor dining set.